Ad Astra Area Aquatics' Patrick Norman runs a swim team that's a coach directed, parent supported, and athlete centered. 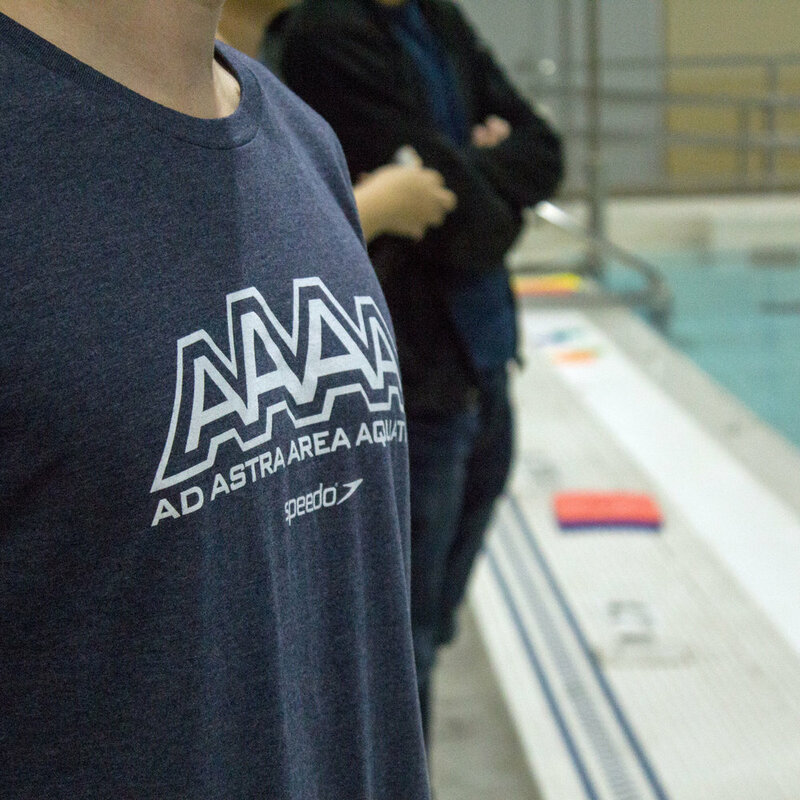 When Patrick Norman started Ad Astra Area Aquatics in 2010, he had 13 athletes enrolled as part of the Lawrence swim team for which he is the head coach. Along with his wife, Katie Price-Norman, who is the head age group coach, they've grown the squad to more than ten times that, with 140 area swimmers. “We've grown a lot since then,” Norman states matter-of-factly about those early days over kombucha in downtown Lawrence one late summer morning. Ad Astra started when the coach left the other Lawrence swim team for which he worked, in order to follow a different model than what his previous team had offered. There is a board for Ad Astra, but as Norman notes, it's more of a sounding board, and less involved in what he refers to as the “wet side” of things. In addition to being head coach, Norman is the president of the Ad Astra organization, and his wife is the business manager. “It was a bit of a movement in terms of what people wanted here in town, and so we started with that in mind and that's how we've been operating ever since,” states the coach. The growth wasn't all at once, obviously. The Ad Astra Area Aquatics team has grown steadily, but Norman says that he thinks they've exceeded any expectations folks might have had when they began, especially as there wasn't a plan, so to speak, when he started. The head coach does acknowledge that they had some good athletes when they started, so it wasn't starting from scratch, but that first year saw the team place place 16th at the Sectionals, and was the third place team at the Missouri Valley Swimming LSC Championships, Small Team Division. The very next year, 2011, would see their rankings move up to 14th at Sectionals, and Ad Astra would be the first place team in the Missouri Valley LSC Championships, Medium Team Division, and be the fourth place team overall. That's an impressive jump, and might explain why the team has qualified four swimmers for the USA Swimming Olympic Trials in Omaha since 2012. Norman says a lot of that has to do with the fact that there's a sort of swimming family in Lawrence. He started coaching in 2001, and swam for the University of Kansas, and some of those kids whom he coached in those early years now work for him. Those are the kinds of stories, Norman says, that when you're really passionate about swimming and love what you do, are really cool. That's sort of the reason why the whole Ad Astra perspective is to start kids out, and getting them in the water with a sense of loving swimming, rather than immediately immersing them in competition. Even as the kids age, however, there are some who aren't necessarily aiming for lifelong athletic competition, and Ad Astra wants them to be part of the community, as well. “Not everyone's gonna want to be that sort of swimmer who's going to go to college and swim, and just keep doing it forever,” Norman says, although he's quick to point out that swimming is the kind of activity you can do all your life. To the end of keeping the folks who want the team atmosphere to encourage them to push the beyond their limits, they have the One Day A Week group. That flexibility in terms of what Ad Astra Area Aquatics does is reflected in their relationship with Blue Collar Press – a willingness to find different things, and work with someone in order to make them happen. Norman's a graphic designer himself, so he comes up with all of the different looks the team has had over its history. He started working with the Press during his final year with his previous team, and he says that, when they started Ad Astra, it just made sense to keep working with Blue Collar. Norman also likes the fact he's working with a company which has been growing alongside his for the last nine or ten years, but has remained just as accessible as when the relationship first began.